Universal Serial Bus (USB) is an industry standard that establishes specifications for cables, connectors, and protocols for connection, communication, and power supply between personal computers and their peripheral devices. 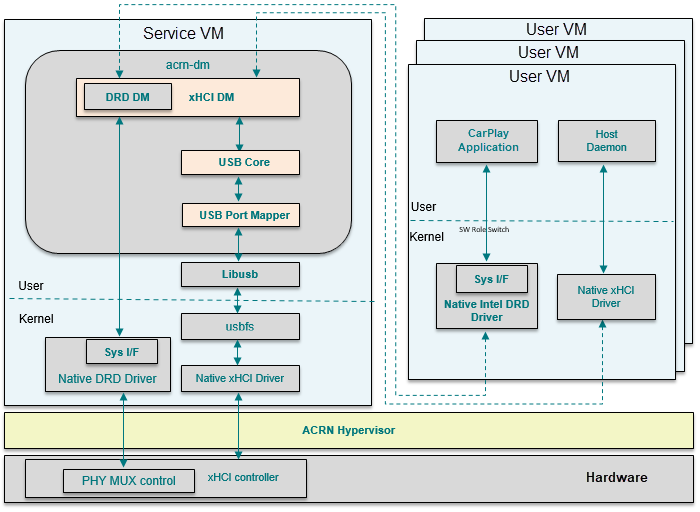 xHCI DM (Host Controller Interface) provides multiple instances of virtual xHCI controllers to share among multiple User OSes, each USB port can be assigned and dedicated to a VM by user settings. xDCI controller (Device Controller Interface) can be passed through to the specific User OS with I/O MMU assistance. DRD DM (Dual Role Device) emulates the PHY MUX control logic. The sysfs interface in UOS is used to trap the switch operation into DM, and the the sysfs interface in SOS is used to operate on the physical registers to switch between DCI and HCI role. On Intel Apollo Lake platform, the sysfs interface path is /sys/class/usb_role/intel_xhci_usb_sw/role. If user echos string device to role node, the usb phy will be connected with xDCI controller as device mode. Similarly, by echoing host, the usb phy will be connected with xHCI controller as host mode. 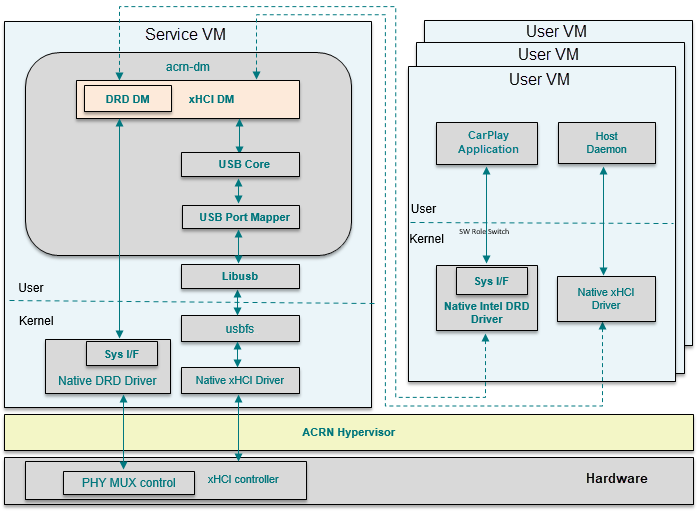 An xHCI register access from UOS will induce EPT trap from UOS to DM, and the xHCI DM or DRD DM will emulate hardware behaviors to make the subsystem run. USB core is a middle abstract layer to isolate the USB controller emulators and USB device emulators. ports to virtual USB ports. It communicate with native USB ports though libusb. All the USB data buffers from UOS (User OS) are in the form of TRB (Transfer Request Blocks), according to xHCI spec. xHCI DM will fetch these data buffers when the related xHCI doorbell registers are set. These data will convert to struct usb_data_xfer and, through USB core, forward to the USB port mapper module which will communicate with native USB stack over libusb. bus-port: specify which physical USB ports need to map to UOS. This configuration means the virtual xHCI will appear in PCI slot 7 in UOS, and any physical USB device attached on 1-2 or 2-2 will be detected by UOS and used as expected. ACRN emulates the DRD hardware logic of an Intel Apollo Lake platform to support the dual role requirement. The DRD feature is implemented as xHCI vendor extended capability. ACRN emulates the same way, so the native driver can be reused in UOS. When UOS DRD driver reads or writes the related xHCI extended registers, these access will be captured by xHCI DM. xHCI DM uses the native DRD related sysfs interface to do the Host/Device mode switch operations. 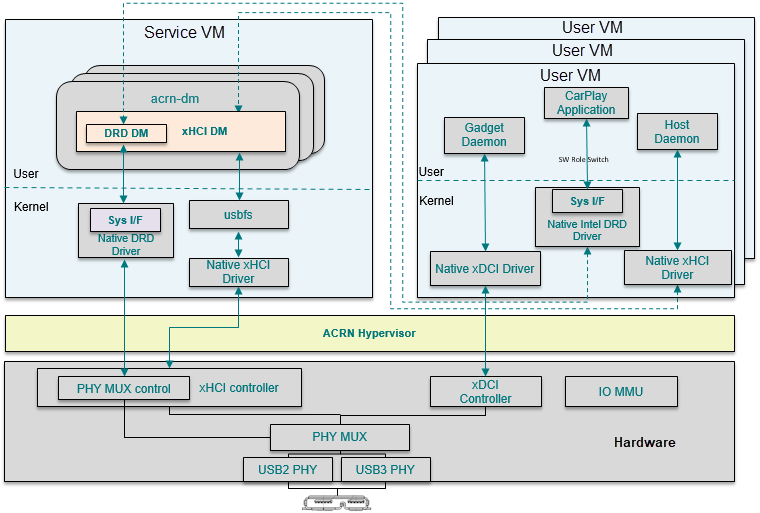 indicates virtual xHCI should emulate the named platform’s xHCI capabilities. This configuration means the virtual xHCI should emulate xHCI capabilities for the Intel Apollo Lake platform, which supports DRD feature.